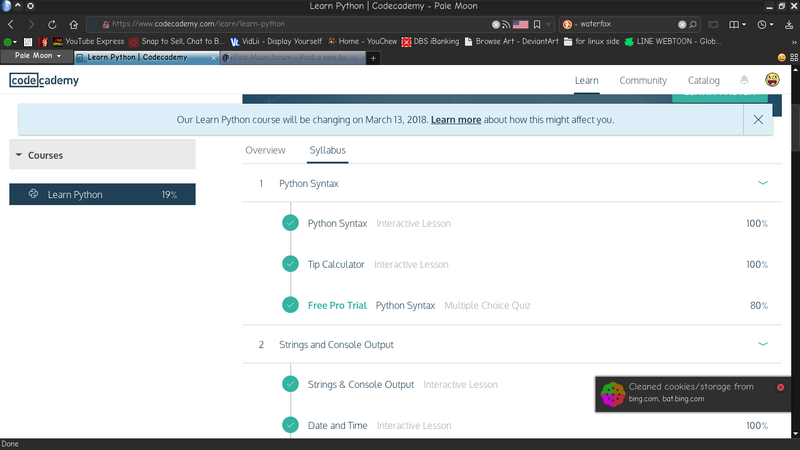 Long story short, a club I'm in (but only for the first 4 meetings this year due to another long story) introduced me to Codecademy, which worked fine on their PCs (Firefox ESR 52.x on RHEL 7.x), but I found it doesn't seem to work right in Pale Moon. 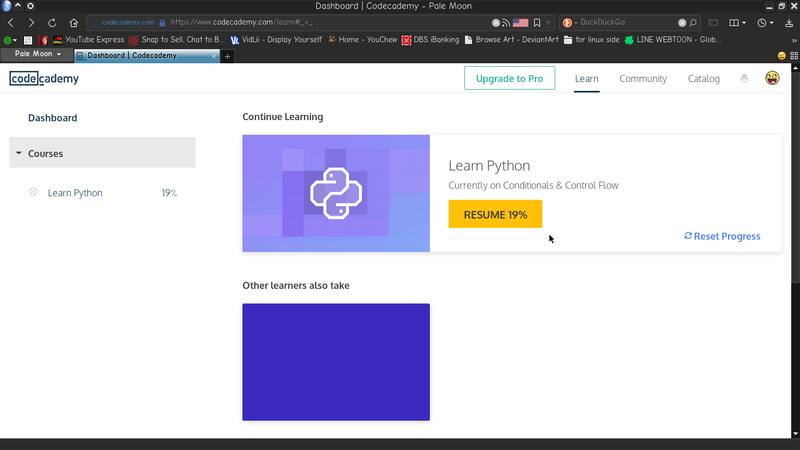 Mainly, the fact that portions of the course viewer are broken (including the navigation buttons and pane), and I don't even get a "Connecting to Codecademy" status indicator in the top left (while loading the course viewer). 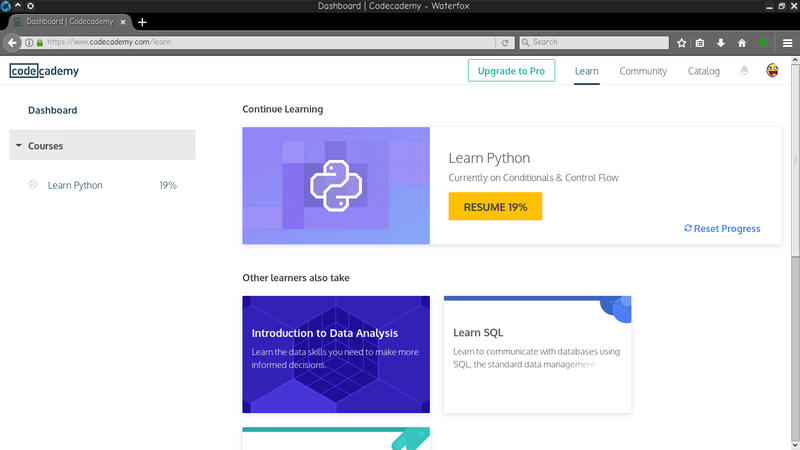 My current workaround is to use Waterfox (abbreviated here as "WFx"), and I decided to skip Basilisk thinking it was a rendering engine and/or platform issue, however, I will be sticking with PM for my default web browser because of its interface. Last edited by kbhasi on 2018-03-09, 17:37, edited 1 time in total. 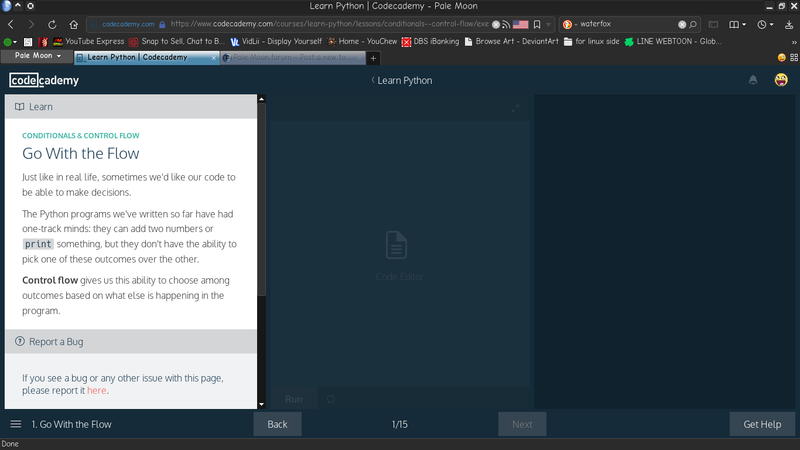 kbhasi wrote: Long story short, a club I'm in (but only for the first 4 meetings this year due to another long story) introduced me to Codecademy, which worked fine on their PCs (Firefox ESR 52.x on RHEL 7.x), but I found it doesn't seem to work right in Pale Moon. 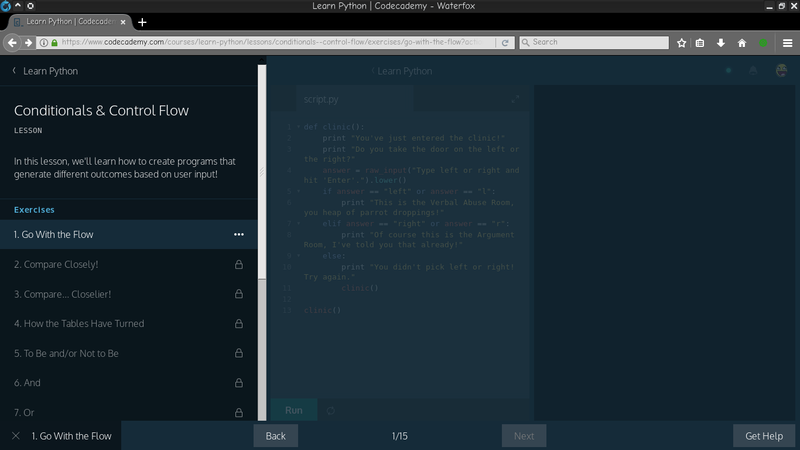 Man, Codecademy... It's been a while but I remember using it during Hour of Code like four or five years ago. 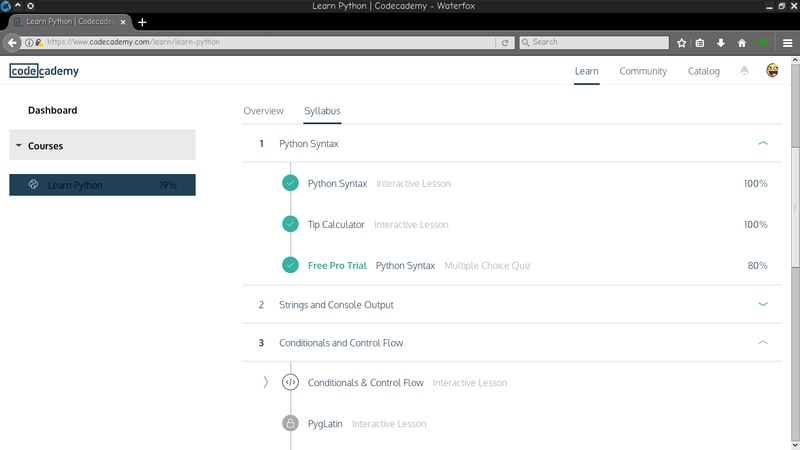 I don't see a problem with the Syllabus view, but I can confirm that the Dashboard is missing some stuff and the course viewer doesn't work (can't use the editor or advance to the next slide). Before someone suggests it, neither a Safari nor a Firefox user agent override fixed it for me. 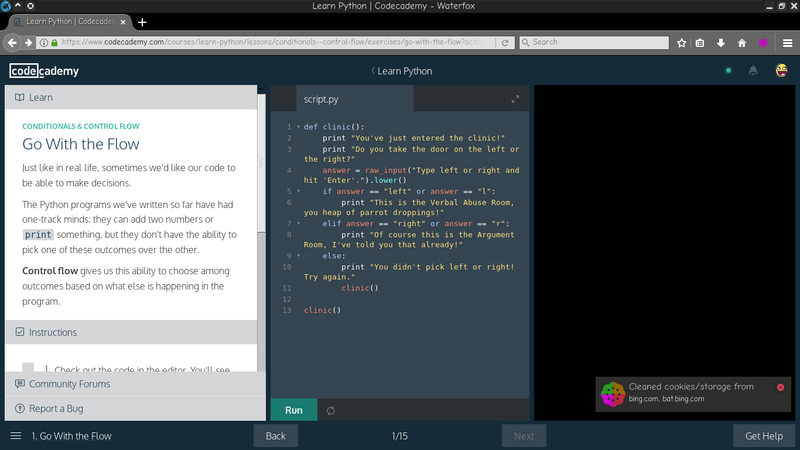 SpockMan02 wrote: Man, Codecademy... It's been a while but I remember using it during Hour of Code like four or five years ago. No, it's not GitHub material. We can't have an issue opened for every broken website out there unless the actual cause has been pinpointed as a bug on our end. Last edited by Moonchild on 2018-03-10, 20:28, edited 1 time in total. It's very likely Issue #900 (900) (also according to tests). Well, for another thing, GitHub also seems to be broken, though I don't feel like posting screenshots of the extent of that. Guess I'm gonna go and add Waterfox to my K-Menu, but I still love PM and its UI. Last edited by kbhasi on 2018-03-12, 05:06, edited 1 time in total. I use GitHub regularly and it seems to work fine here, what's broken. I guess this might be related to your setup as there aren't any issues reported for GitHub. adesh wrote: I use GitHub regularly and it seems to work fine here, what's broken. I guess this might be related to your setup as there aren't any issues reported for GitHub. An example of this would be that when I was using Edge (which was what I was using before I switched to using PM full time), I kept receiving adverts for Chrome on sites that use Google AdSense for advertising units. 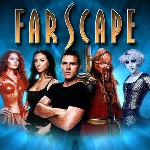 Using the Edge developer tools to spoof the user agent as Chrome itself, allowed me to not see those adverts, albeit with slight issues on some Google websites, one of which was YouTube (with the older interface) from what I remember. I do remember this happened back in 2016. One of the things I like about PM is that it's just... different. Weirdly enough, I tested the GitHub page in PM on 2 other PCs, both also running PM 27.8.1, both updated to that earlier today, and both of them do seem to load the page correctly, while the install here, which has way more plugins, and sync enabled (the other 2 PCs don't have it enabled). Of the 2 other PCs, one runs Debian 9, while the other one runs Windows 7. My main system, where I'm experiencing the problem, is running Debian on its "testing" channel. Edit: GitLab seems to be broken as well. Strange. Last edited by kbhasi on 2018-03-14, 14:39, edited 2 times in total.